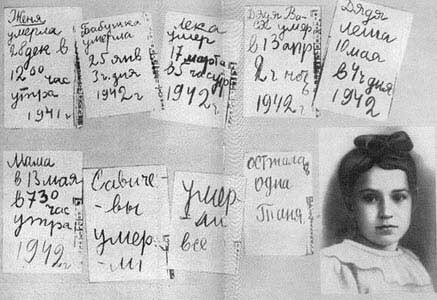 Today «The Diary of Tanya Savicheva» is in the museum of history of Leningrad (now St. Petersburg ) and a copy is at the Piskarev cemetery where 570 thousand people who died in Leningrad during the 900-day blockade rest (1941-1943). The child’s hand, losing strength quickly due to extreme hunger, wrote short words and wrote them unevenly. The delicate soul of the child was paralyzed by extreme suffering and was unable to feel anymore. Tanya just wrote down facts that surrounded her – tragic visits of death to her home. …She was the daughter of a baker and a seamstress, the youngest in the family, beloved by all. She had big gray eyes, long blonde bangs and wore a little sailor suit. Her bright, ringing voice showed lots of promise in terms of singing. In fact, the whole Savichev family was gifted musically. The mother, Irina Ignatievna, even created a small family ensemble: two brothers, Leka and Misha, played the guitar, mandolin and banjo, Tanya sang, and the rest were the choir. The father, Nikolai Rodionovich, died young and so Irina Ignatievna had to go out of her way to support a family of five. As a seamstress of the Leningrad house of fashion, she was popular and made good money for the times. Beautiful examples of her work – curtains, napkins, tablecloths, decorated the house. Tanya also learned to sew at an early age. What she loved most was to sew flowers…. The summer of 1941, the Savichevs were going to spend a village close to Gdov, by lake Chudskoye . But only Misha left for the village. The morning of the 22nd of June, which brought the war, changed all plans. 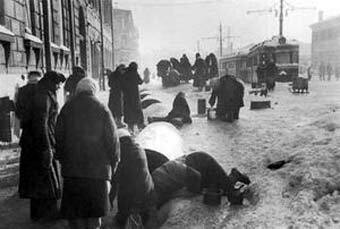 The family decided to stay in Leningrad , to be close together and to help the front in any way they can. The mother sewed uniforms for the soldiers. Leka, because of his bad vision, was not drafted and worked at a factory instead while his sisters Zhenya and Nina worked at a factory sharpening mine bodies as well as strengthening city defenses. Tanya also worked. She helped the others to dig trenches. But the ring of the Blockade that surrounded Leningrad still became tighter and tighter. As Hitler stated in his plans: « Leningrad will be strangled by hunger and leveled of to the ground». One day, Nina did not come back from work. That same day, there was a big bombardment and everyone was worried about her. But as time passed and it became apparent that Nina was not going to come back, the mother – Irina – gave her daughter Tanya a small notebook in memory of her sister Nina. This notebook was where Tanya later started her diary. 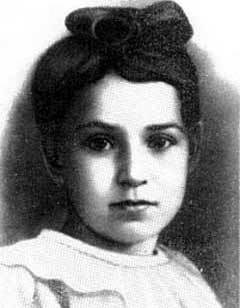 Zhenya, Tanya’s other sister, died at the factory. She worked two shifts in a row and after that also gave blood. She just didn’t have enough strength. Soon the grandmother of the family was sent to the Piskarev cemetery – her heart burst. The «History of the Admiralteyskiy factory» also contains the following lines: «Leonid Savichev always worked very diligently even though he was very thin and worn out. One day he didn’t come to the factory. It became known that he died the previous day «. More and more often Tanya opened her diary – one after another her beloved relatives left her and finally even her mother. «All the Savichevs died. Only Tanya is left». Tanya never found out that not all the Savichevs died. Her sister Nina was saved and transported away from the front line. In 1945, she returned to her home city, to her house. There, amidst bare walls and complete ruin, she found Tanya’s notebook. Tanya’s brother Misha also survived after suffering severe injuries at the war. The heart cannot cease to remember. Otherwise, we will loose our roots, our past. And without the past there is no future.